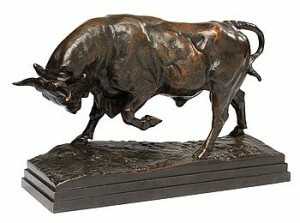 1845, Combatant le Minotaure, second version. 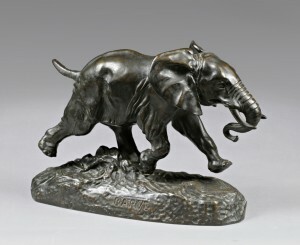 Antoine-Louis Barye was the earliest and most famous of the French animalier school, renowned for his studies of wild animals in a way which was both romantic and less inhibited than many of his successors. 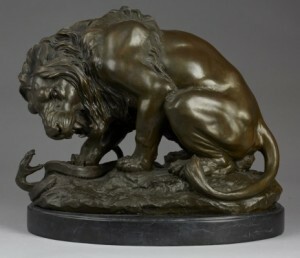 A major reason for his high technical ability was his study of animals in the Paris Zoo where, as well as studying their behaviour and movement, he would also dissect carcasses to explore their anatomy and musculature. 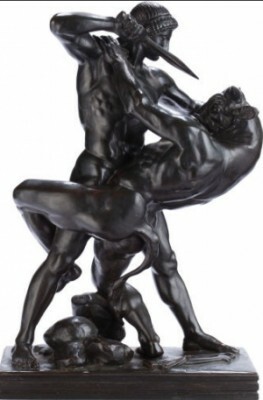 His father was a goldsmith; Barye was himself apprenticed to Napoléon's goldsmith in 1809. 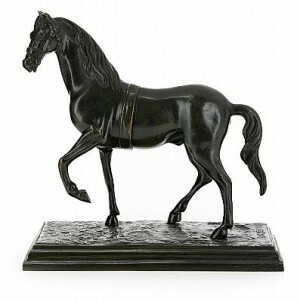 In 1812 he joined Napoléon's army as a topographical engineer; after Waterloo he studied in Paris under the sculptor Baron François-Joseph Bosio and the painter Baron Antoine-Jean Gros. 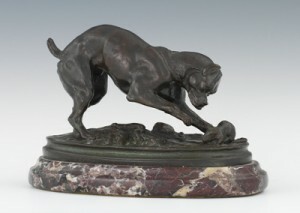 He attended the École des Beaux-Arts from 1818 to 1823, but after failing to win the Prix de Rome he left and worked under a goldsmith who required him to model numerous small animal figures. 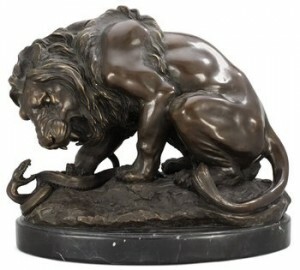 He became strongly interested in animal sculpture, studying living animals at the Jardin des Plantes (the Paris Zoo) and skeletons at the Musée d'Anatomie. 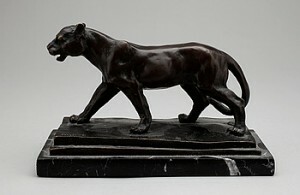 In 1831 he exhibited his Tiger Devouring a Gavial in the Paris Salon, where it drew critical acclaim. It is from this point that his career as an animalier begins. 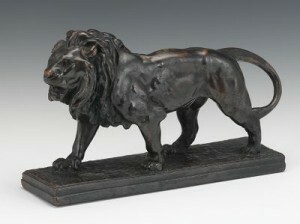 His patrons included the French royal family; one early commission, begun for the Duc d'Orleans in 1837, was for a centerpiece for the Duc's table; the work as designed turned out to be too heavy for the existing table, which collapsed under the weight of the base alone, and the project was abandoned. 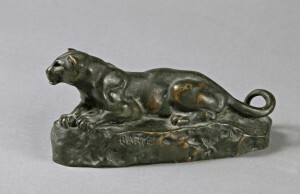 In 1839 Barye established his own foundry and a gallery through which to sell his work. 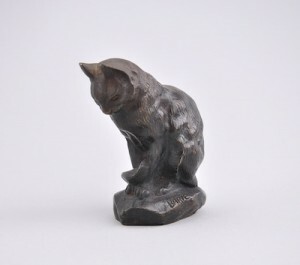 He had worked exclusively on commission heretofore, but was now modeling animal bronzes for purchase by the general public. In 1848 he became a curator at the Louvre, but held the position for only two years; he was compelled to resign owing to the unstable political situation at the time. 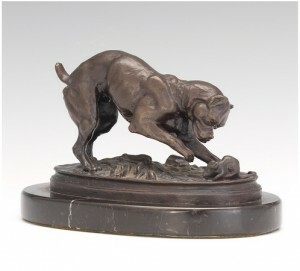 He continued modeling animals, periodically publishing catalogues of works available for sale. He also continued to work on commission, and taught at various institutions. 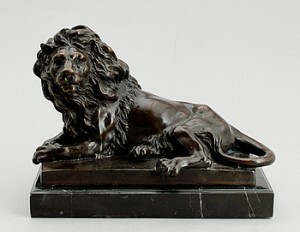 He became a Professor of Drawing for Zoology at the Museum of Natural History in 1854.